Home / Blog / Do Bicycles Have A Right To Be On The Road? Do Bicycles Have A Right To Be On The Road? Bicyclists must obey traffic laws just like motor vehicles, but these “side-of-the-road” laws are often the cause of the most common types of bicyclist traffic accidents. It’s important for bicyclists and vehicles to be aware of the different types of laws that protect everyone’s safety. “Side-of-the-road” laws are common in every state, and they require bike riders to travel on the far-right side of the road when they aren’t traveling as fast as cars on the road. Different states may have other laws that protect a bike rider’s right to the roadway. In general, a bicyclist has a right to ride in the middle of the road as long as they are traveling at the appropriate speeds. When the bike rider can’t maintain the speed limit, they need to move to the far-right side of the road. If a special bike lane is available, then the law requires cyclists to utilize the lane unless they need to avoid road hazards, make a left turn or can maintain the speed limit. It’s important for motor vehicles to understand that bikes have a right to the roadway, so cars are a responsibility to slow down or wait until it is safe to pass them. It’s not the bike-rider’s duty to stop or get off the roadway. The most common types of traffic accidents involving bikes usually occur when the cyclist collides with an opening car door, makes impact with a car turning right through a bike lane or is struck by a passing car. 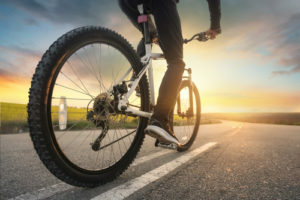 The experienced personal injury attorneys at Blume, Forte, Fried, Zerres and Molinari are well-versed in the traffic laws that protect the rights of bicyclists. When you’ve been injured as a result of following “side-of-the-road” rules, you need a legal advocate to assert your rights in court. Call 973-635-5400 now to speak with one of our experts.